The Nun Apollinaria was a daughter of Anthemias, a former governor of the Greek empire during the minority of Theodosius the Younger (408-450). Having declined marriage, she requested of her pious parents permission to venerate at the holy places of the East. Having arrived in Alexandria from Jerusalem, she secretly away from her servants changed into the garb of a nun and hid in one of the marshy places, where she practised asceticism for several years in strict fasting and prayers. 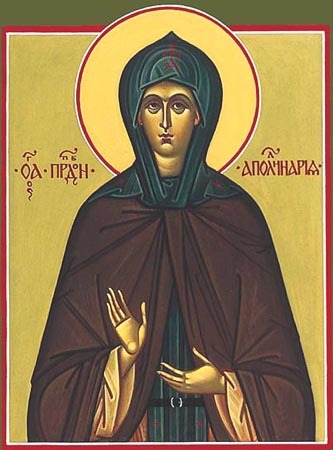 By a revelation from above, she was guided into a skete monastery to Saint Makarios of Egypt, and took for herself the monastic name Dorotheos. The Monk Makarios accepted her into the ranks of his brethren, and she there quickly distinguished herself by her ascetic life. The parents of Apollinaria had also another daughter, who was beset by demons. They sent her to the skete to the Monk Makarios, who took the sick girl to the monastic Dorotheos (Blessed Apollinaria), through whose prayers the maiden received healing. In returning homewards the maiden was again beset by a violent demon, which gave her the appearance of a pregnant woman. This produced great anger in her parents, who dispatched soldiers to the skete, and they demanded to see the perpetrator of their daughter's outrage. Saint Apollinaria took on herself the blame and went with the envoys to the home of her parents. There she revealed her secret to her parents, healed her sister, and returned to the skete, where in a short while she died peacefully in the year 470. Only after the death of the monastic Dorotheos was it revealed that this was a woman. The body of the saint was buried in a cave in the monastery church of Saint Makarios of Egypt.